Geshe Tenzin Wangdak was born in Central Tibet in a small village called Mangra in 1972. After junior high school, he decided to go to India to study Buddhism. In the year of 1986, he became ordained and joined the Drepung Loseling Monastery. At the Drepung Loseling Monastery, he studied The Five Great Texts of Buddhist philosophy (Perfection of Wisdom, Middle Way, Valid Cognition, Monastic Discipline and Treasure of Knowledge). He was also an assistant to the chant master and he taught other monks to chant prayers as well. After twenty years of studies both at the Drepung Loseling Monastery and the Gelugpa University, he obtained his Geshe “Tsok ram” and “Karam” degrees in 2008. 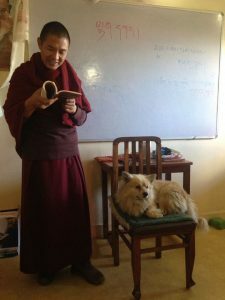 After the graduation, Geshe Tenzin Wangdak left for Dharamsala and joined a three-year program aimed for Geshes at the Institute of Buddhist Dialectics (IBD) where he studied Chinese and English languages, Western philosophy, science, and world religions. In 2012, he participated in an intensive Translation Program for three months organized at the Library of Tibetan Works and Archives (LTWA) in Dharamsala. 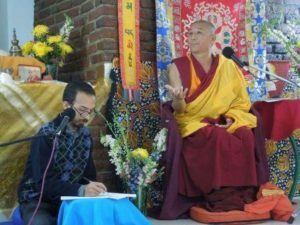 Since 2012, Geshe la has been giving Buddhist philosophy classes to Westerners both in English and Tibetan, and he has also been helping with translating various texts, editing, proofreading and so forth. He is always happy to teach Buddhism to the people who are interested in it. 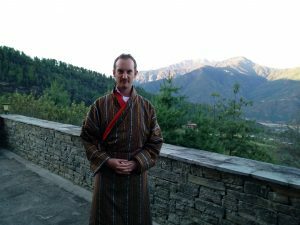 Since 2013, he has been working at the Lotsawa Rinchen Zangpo Translator Program as a teacher and tutor coordinator. Filip Majkowski was born in 1980 in the south of Poland. In 2004 he completed his Master’s Degree in the English language and culture at the Department of Philology and Modern Languages at the University of Warsaw. Prior to that, in 2003 he began to study Tibetan language and in 2004 joined the Faculty of Oriental Studies (University of Warsaw) as a full time student. In 2006 he completed and defended his BA dissertation “Fundamentals of Tibetan Medicine according to the work ‘Essence of Ocean of the Art of Medicine’” and enrolled at the same Faculty as a PhD candidate in the field of Tibetan and Mongolian literature. He received his PhD title and diploma in early 2014 upon presenting the dissertation “Translation and critical analysis of the first chapter of the fourth book of the Tibetan medical treatise ‘rGyud bzhi’ and the corresponding chapter of the commentary ‘Blue Vaidurya’ by sDe srid Sangs rgyas rgya mtsho”. From 2004 to 2007 Filip worked in the Tibetan Medicine Buddha center in Warsaw as an assistant and interpreter to the Tibetan physician Dr Ven. Tenzin Jangchub, disciple of Dr Yeshe Donden. And it was there that his interest in traditional Tibetan medical system (Sowa Rigpa) began. In Poland Filip gave many public talks on Tibet, Tibetan culture, medicine and political situation, also appearing several times in various radio stations to discuss the current situation of Tibet. He has also been English language editor of various scholarly publications on Tibet, Asia and other fields of Oriental studies. During his time as a PhD candidate Filip taught for 7 years at the University of Warsaw. He mainly conducted classes in Classical and Modern Tibetan language, teaching undergraduate and graduate students of different levels. He also gave university lectures on Tibetan Buddhism and culture, taught reading difficult texts and translation techniques. In 2012-2015 Filip attended the shedra in Benchen Karma Kamtsang Monastery in Grabnik, Poland to study classical Tibetan Buddhist texts. Since 2007 Filip has been extensively traveling to India, visiting mostly Dharamsala as well as other Tibetan settlements and Buddhist pilgrimage places, particularly Bodhgaya. Since 2012 he has been a licensed tour leader and traveled to various destinations within Asia, like Nepal, Tibet, Vietnam and Bhutan. In 2012 he was for the first time member of the translation team for Kagyu Monlam festival in Bodhgaya and since 2015 has been member of His Holiness the Seventeenth Karmapa’s international publicity team. In 2017 he became director of LRZTP. A self-described linguistics geek, Alex is a former LRZTP student, who is committed to helping spread the Buddhadharma into other languages. After earning his BA in Modern English Literature and Language from UNAM, in Mexico City, Alex entered the editorial world to explore his passion for language, writing, and communication. Alex has also volunteered in the FPMT for some years, working as Thubten Kunkyab’s study group coordinator in Mexico City, and interpreting for teachers such Venerable Robina Courtin, Geshe Thubten Soepa, Jonathan Landaw, and Karuna Cayton, among others. Now turned Tibetan translator and interpreter, Alex has developed a unique perspective on how to bring the wisdom of Tibetan Buddhism into the Western world. After spending the last few years studying Tibetan language and culture, Alex is currently most passionate about creating materials for learning this language. Influenced by the living example of his gurus and teachers, he aspires to help other students so their experience of studying Tibetan in LRZTP can be as joyful as possible. While teaching assistant is his primary job function by day, Alex also enjoys knitting, reading 19th-century novels and watching movies from the 1950s.